For some women, there is nothing more exquisite than a beautiful piece of jewelry. However, for me, there is nothing more elegant then beautifully defined makeup. Whether that be an eyeshadow, face powder or blush, nothing speaks elegance like a well engraved image on the surface of a compact. I heard of the company Chantecaille one day all by accident. I was watching a youtube video where the Coral Reef eyeshadow compact was displayed. I was immediately in awe of the beauty of that compact. The lasered etched design was so precise that you swore you were looking at a beautiful piece of art. The colors of the compact were so vivid, that it seemed like I was looking into a prism of colors that meshed so well with each other. The gold stained coral reefs that laid on top of each eyeshadow were so alive that they speckled in the sunlight so lovely. Sadly this compact is no longer in circulation. Nonetheless they have others that are just as beautiful. I decided to google the company after seeing this beautiful work of art and see if by chance they had other amazing makeup "pieces". And oh so they did to my great delight. My search lead me to their face powders. I love face powder and wear it all the time after applying my foundation. However the one thing I dislike about face powder is that awful powdery look it leaves you. The point of makeup is to seem as if though you are not wearing any. However when others can spot your foundation and/or powder; well it destroys the look you were going for. This compact is etched so precisely with the image of a beautiful White Bengal Tiger. If you look closely you can see the lines that make the face and hair of the tiger. The color of the tiger resembles a two tone effect. The majority of the tiger is of a gold speckled color and the rest is of an off white tone. When you apply this powder compact, it leaves your skin with an ever so subtle sparkle effect. 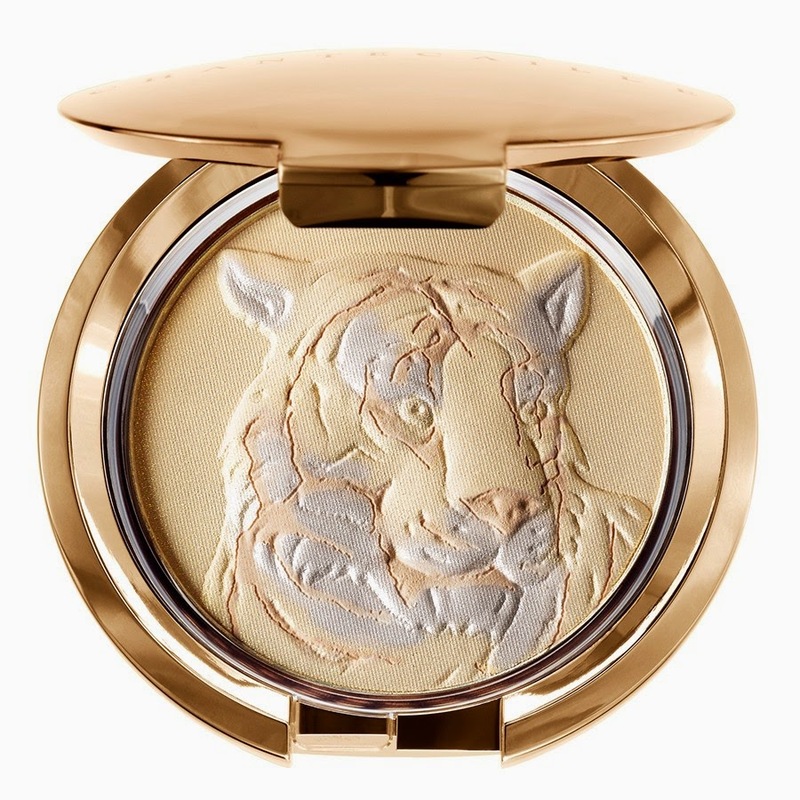 However after a short while, the two tone effect leaves as it is only superficially implanted on the face of the tiger and you are left with a translucent color compact which was the original point. This powder in this compact is so finely milled that you never see it on your face when applied. It doesn't settle into the fine lines of your face and actually works wonders for setting in your concealer. Since its so finely milled, the powder will not deepen into your under eye lines. Instead it sets your concealer so that it doesn't move all day. It leaves you a matte finish that actually looks luminous and not dull. Its infused with Tahitian Monoi which causes the skin to look and feel hydrated. This compact comes with a velor puff which is found underneath the compact in a different compartment. However with all that being said, this compact is not cheap. It cost $85.00 US and for many that is out of their price range or simply not worth spending. Nonetheless I will say this. This compact is not small. It encompasses the full size of the palm of my hand. I normally apply this compact with my Blank Canvas F25 brush as its large enough to envelop my whole face. This not only sets my foundation but leaves me with that soft luminous look. Since this powder is very light weight and finely milled, you can use it year around without the heaviness that some face powders offer. A beautiful side note! For every compact you buy, Chanecialle donates 5% of all sales to the conservation of these animals. The founder is a serious and respected philanthropist who believes in the conservation of endangered animals. Every year a palette is designed in honor of the animal they are supporting. The only downside is that the majority of the palettes are limited editions. While new ones come out each year I will miss my Coral Reef palette once it runs out! Check out their website in order to find other beautifully etched compacts! I truly love this face powder so much that I bought two! I would for sure recommend this compact despite the price tag!